The CafeReo website revealed today that the well-received Mame Sengoku Basara Trading Figures from January 2014 are making a comeback in July, this time with new versions of Masamune and Mitsunari clad in their alternate Sengoku Basara 3 costumes! The new set of nine figures will cost ¥5,850 (or ¥650 per blind-boxed individual figure) and it will appear on hobby websites very soon. The new set is officially titled Sengoku Basara Trading Figures: Mame Sengoku Basara PLUS. ...this is a cruel way to make us want to buy the entire set a second time just for two alternate figures, isn't it? I wish they'd made alternate versions for the other characters in the set as well. CafeReo have also announced a pair of purse/handkerchief sets for Masamune and Mitsunari in July 2014, priced at ¥1,500 each. There's been an update about the Sengoku Basara Complete Box anime Blu-ray collection: a pocket-sized version of the standard movie pamphlet for Sengoku Basara -The Last Party- will be included in the pack as an extra bonus for buyers. Fans without access to Dengeki Maoh magazine can finally look forward to reading Yoshihara Motoki's Sengoku Basara 4 official manga adaptation in a few months. The first volume has been scheduled for 27th June 2014 under ASCII Media Works' Dengeki Comic NEXT label. 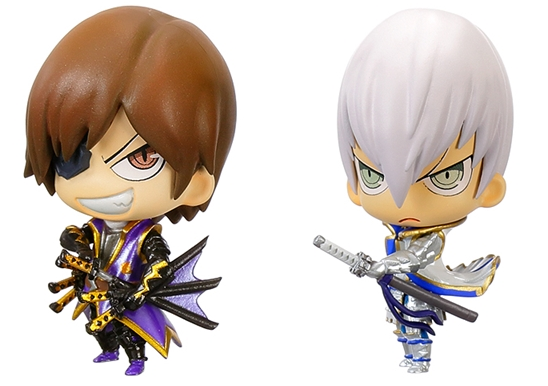 Mame Sengoku Basara goodies - and more Sengoku Basara 4 plushies are planned? 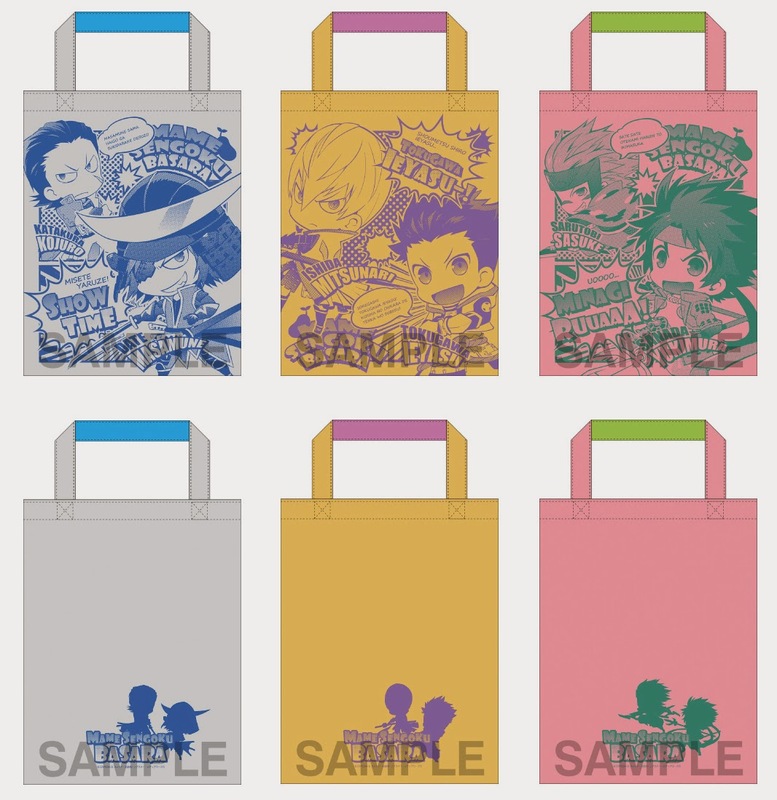 The cruel people at Gift are going to be selling three amazing Mame Sengoku Basara tote bags at May's Super Comic City doujinshi sokubaikai event for ¥1,500 apiece. 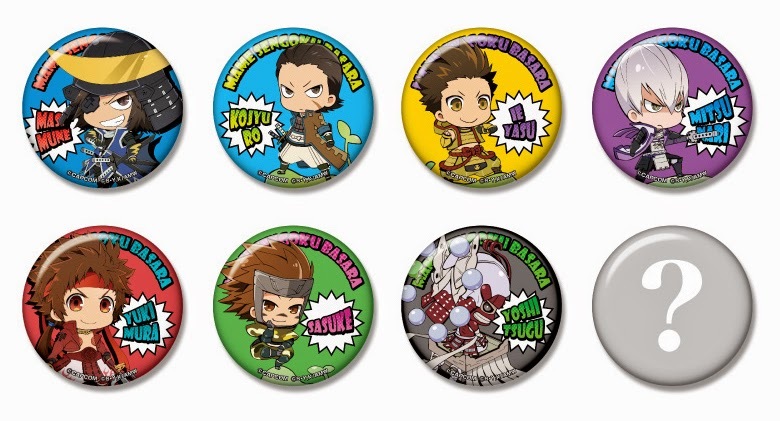 That's not all that they have planned - bigger pictures of the new range of ¥200 Mame Sengoku Basara tin badges which are being sold in six selected Animate stores from 10th May 2014 are available too. I know you're a fan of the Date clan, so I'm happy for ya Raindrops but... Let me have a bit of disappointment!! Yet again more Sanada/Sekigahara pals/Date/Setouchi stuff, gah. I'm honestly shocked Gyoubu got something. It seems like I missed out on the right time to be a fan of the Uesugis, Maeda couple, or Oichi. Seems like they aren't even trying to market Naotora or Sorin either. :( Ah well. Sorry to be a negative nancy and if you want to delete the comment to keep your blog positive, by all means do so! While Keiji's a main character in Mame Basara, he just doesn't have a sort of pair or rival to match him with yet since he was made to be 'the third guy' of the poster boy batch. The Setouchi pair and the second-in-commands tend to get more stuff than him because they pretty much come in iconic pairs. Although I hope with Mame Basara 4 he finally gets Yoshiteru to hook him with. After all, Shogun-sama is really popular in Japan and him + Keiji have been getting paired artwork shafted out like woodwork these days. That's true, Yoshiteru needs a buddy too and they both have similarly 'luxurious' looking designs (I really like their detailed costumes). More official artwork of them both together would be great!